In addition to all of the exciting sessions happening at Shop.org, retailers have the chance to participate in retailer only programs that will help them connect with industry leaders and solution providers. All events below, except for the Executive Afternoon and NRF ENGAGE, can be added to your Shop.org experience when you begin the registration process. Exclusively for a group of 100 retail marketing, e-commerce, mobile, and technology executives, the Executive Afternoon program is an interactive mix of presentations, discussions, and networking taking place at the headquarters of TechStyle Fashion Group (JustFab), in El Segundo, California. Attendance at this program is by invitation only. 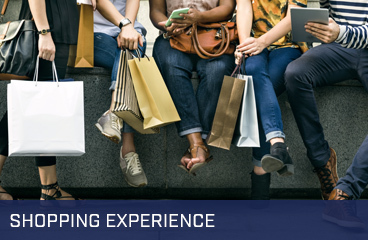 In Partnership with the Global eCommerce Leaders Forum (GELF), this executive half-day program offers numerous sessions on how retailers and global brands can get there hands into the fastest growing market in the world - China. Through five exclusive networking dinners, Digital Bites brings together retailer peers to share ideas, insights, and reflections from the day in a relaxing environment. Locations include Mortons, The Palm, WP24, Ford's Filling Station, and Wolf Gang Puck's Bar & Grill. NRF ENGAGE is a new, free program that helps retailers discover innovative solutions for their business through private, pre-scheduled meetings with tech startups and exhibitors. Developed in partnership with Sophelle, these 1-on-1 curated meetings will set you up with a solution provider best suited for your business' needs. This additional program at Shop.org gives you the opportunity to experience LA unlike anyone else. Blending an array of exciting, high-end retail choices with a community feel, The Grove is one of the country’s most acclaimed shopping, dining and lifestyle destinations, attracting guests each year from Southern California and around the world. Shop.org will provide complimentary transportation, and you'll also receive a welcome package that contains a $25 American Express gift card to use at any of The Grove's 50+ stores. Spots are limited for each event, so sign up when you register for Shop.org. This event is sold out! Be one of the first 150 people to RSVP and get a free ticket to see the Los Angeles Dodgers vs. San Diego Padres game and attend an exclusive networking party on September 26. * Shop.org will host the special pre-game happy hour on the Loge Terrace where you’ll be able to talk shop and baseball with the most successful and influential people in digital retail. This event is open to retailers and non-retailers, and free transportation to and from Dodger Stadium will be provided. Visit the Agenda page to view the dates and times of these programs.